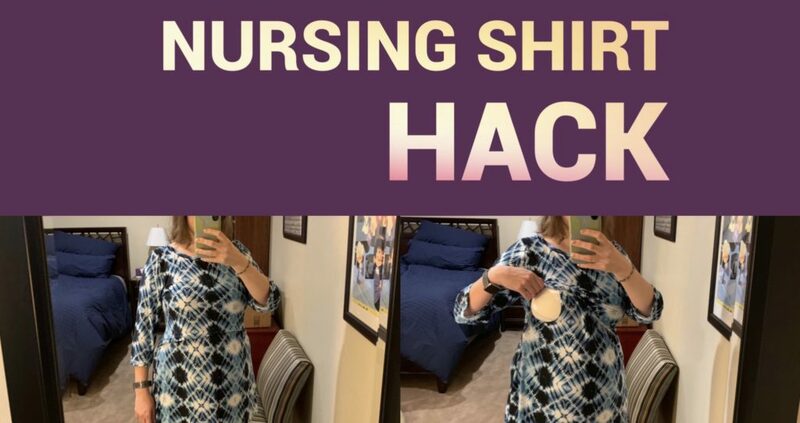 This post explains how I modified a standard knit top pattern (specifically, the Hallå Patterns – Agnes Swing Top) to be a nursing shirt with a lift-up layer and side access. This technique could be used to modify any solid front knit top you’d like, though. 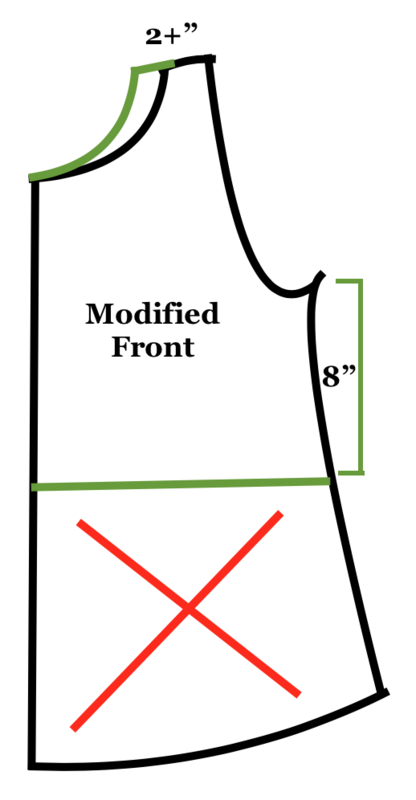 I recommend adding a notch in the middle of the side seam so it will be easier to line them up later. Stack your two front pattern pieces on top of each other, and cut or mark a notch on both pattern pieces (below, in blue) in the center of where the side seam will be. Cut out your fabric pieces. 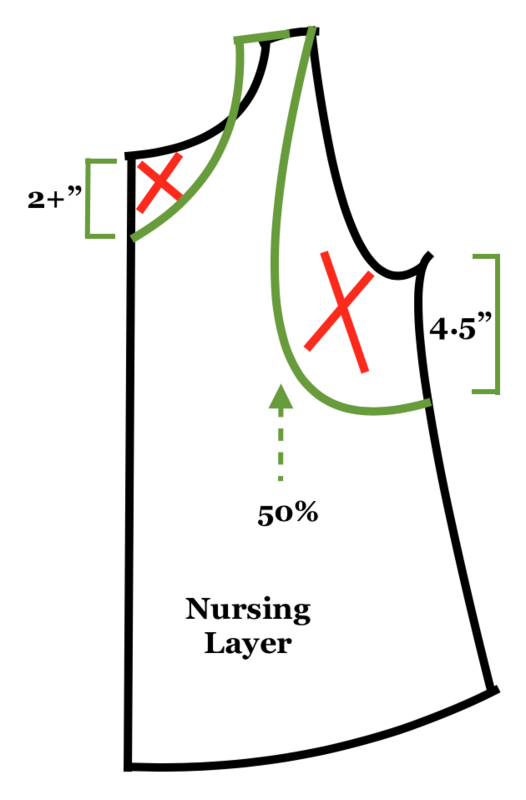 If your fabric has a pattern, you may want to fussy cut the front overlay so it matches the same pattern position as the nursing layer, so that it appears to be seamless when stacked. Fold under and top stitch the flat bottom edge on your front overlay, using a double needle or stretch stitch. 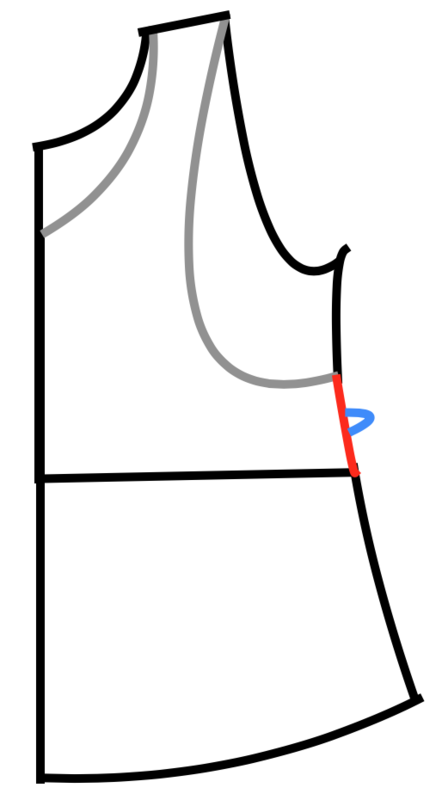 I did not hem the edges or neck of the nursing layer since they aren’t visible from the front and I didn’t want to add extra bulk, but you could if you wanted. 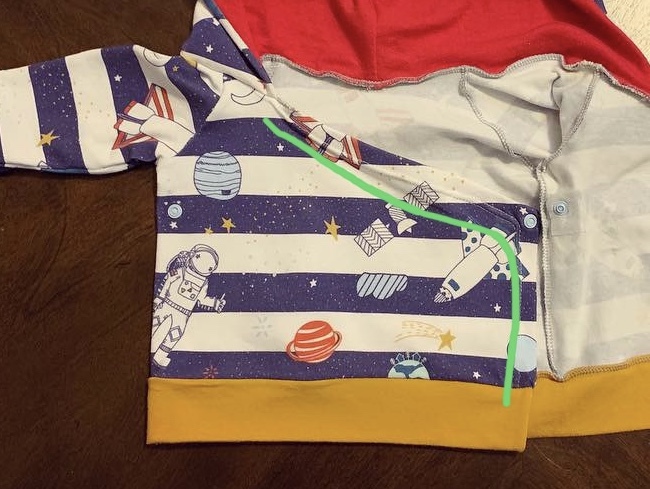 Lay the front overlay on top of the nursing layer (right side facing up for both, like it will look when you wear it). If you have clear elastic, you can add some in the shoulder seams to reinforce them further. 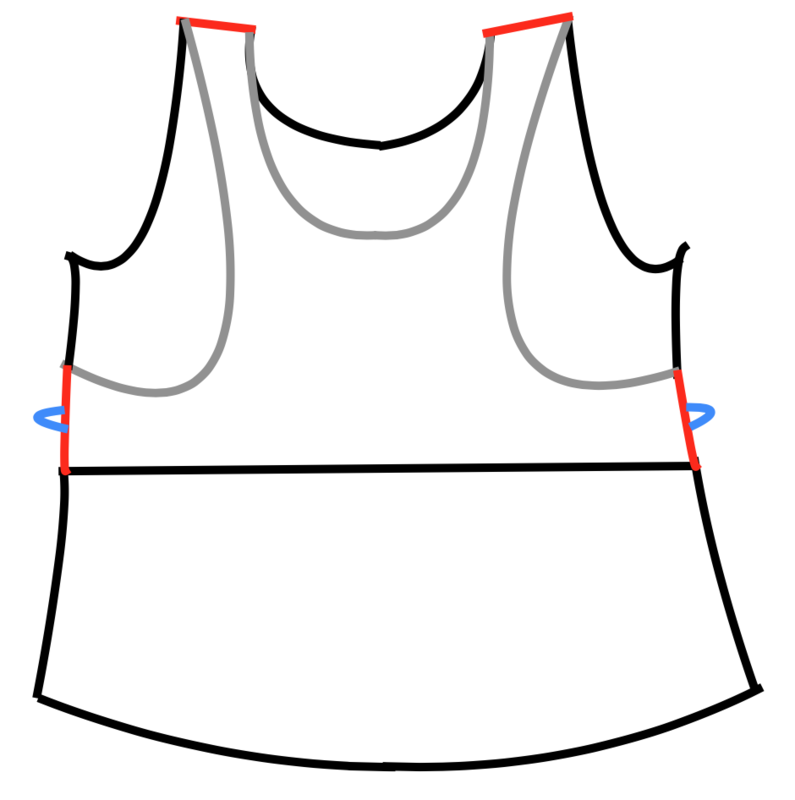 Sew the two pieces together at the shoulders, and on the sides (below, in red). 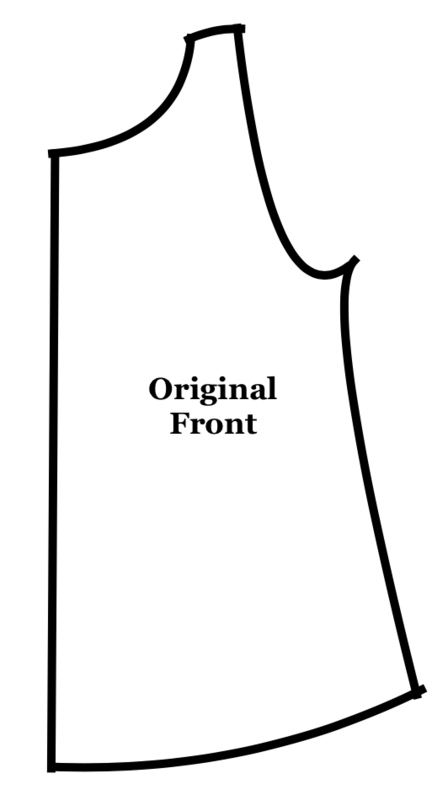 Now that you have your front overlay and nursing layer attached, continue with the original pattern as designed, treating that combined layer as the front piece. That’s it! Comment if you have any questions, or if this hack worked for you. I’ve just finished making a super cute baby modification to the Brindille & Twig Free Raglan Hoodie pattern, which changes the pullover design to have a front panel that snaps. Pictured is the 0-3 month size. When I got to Step 4 of the pattern (to attach the sleeves, front, and back panels), I started with one front panel, attached a sleeve, attached the back, attached the other sleeve, then attached the other front panel, so instead of a closed ring of pieces, it was an open-ended chain. Step 6, I attached the wrist cuffs as described. For the waistband, I folded my extra long strip (as mentioned above) in half on the edges, right sides together, and sewed the short ends closed independently. I skipped to step 7, and attached the waistband after. Step 7, I made the lined hood as described. When it comes to the pinning part, I pinned the back of the hood (where the seam is) in the center of the back panel, and then pinned the rest of the hood where it fell, around the rest of the neck opening. As you can see in the picture, it won’t come close to overlapping, so I removed the pins on the ends of the hood (to about where the raglan sleeve seams were), and folded the opposite corner of the front panel down, and top-stitched a 1/2″ seam down that angle, and down the open edge of each front panel. I then attached the waistband by turning the corners right-side out, and pinned the band to the bottom of the jacket and sewed down the long side to attach it in a straight line. For the snaps, I used 2 KAM size 16 snaps, and positioned them on the corners where the front panel seam turns. I did put a 1″ square of fusible interfacing on the back of the panels that were just one layer (my hoodie was made with cotton lycra, so pretty lightweight/stretchy). The other side of the snap that was through the double-thick hem, I didn’t worry about stabilizing. 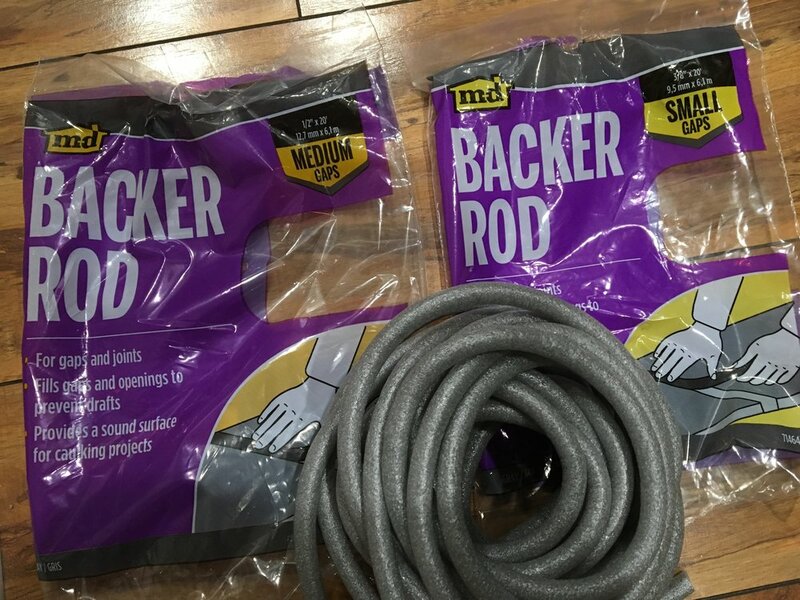 Hopefully that description helps you if you attempt this hack! Let me know if you have any questions. Disclaimer: This will not include hot module reloading for the scss files. 😭 This is very lame, but it’s discussed here that it’s better to build your css the same way in dev and prod (rather than using different loaders for the two environments), so until there’s a valid loader that can do both, this is the method they recommend. The default app has a file called “site.css” in the /css folder. Rename this to “site.scss”. Psst: DON’T change the file name in your webpack.config passed to the ExtractTextPlugin; that is specifying the name of the output file. You are now cookin’ with SASS. Terrible pun intended. Since I have a new baby, it’s no surprise that my iPhone is out of storage. I have backed everything up on my computer (and Google Photos as a back-up backup) so it’s time to delete them off of my phone. Except I don’t want to delete ALL of them; I have several albums I’d like to keep, and specifically, photos I’ve marked as “favorites” I’d like to keep after the purge. How do you do this without deleting photos one by one? 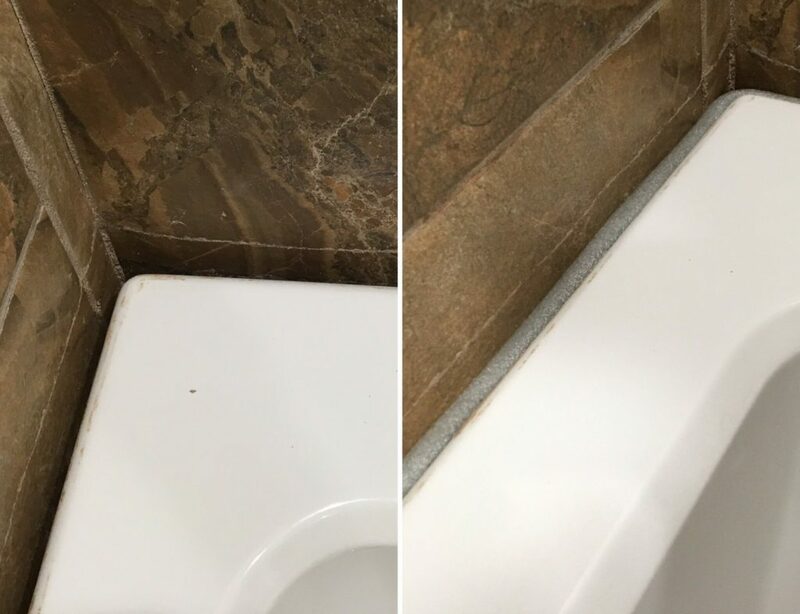 It’s a multi-step process. Un-hide the photos you wanted to keep and you’re done! There are a couple ways to do this on my current iOS (iOS 10.2). If you want to hide an entire album, open that album in the Photos app (on your phone), click “Select”, and click “Select All”. Then click the export icon, and at the bottom of the export screen there’s a “Hide” option. Do this for any albums you want to keep, including Favorites. If you’d rather hide a single photo, tap on it to view as normal, and click the export icon. Then you can click the hide icon at the bottom. If you’re in “Albums,” including “Camera Roll,” you will still see your hidden photos. Go to “Photos” on the bottom to hide your hidden photos. Then click a category until you see the “Select” option appear at the top. Click “Select”, then click “Select” next to each day until you have selected everything you want to delete. You can hit the trash icon periodically to delete what you have selected so far. This is also a handy way to un-select anything you missed hiding but still want to save. Be sure to tap the trash can at the end to delete everything you have selected. I wish there was a way to “Select All” that are remaining; if you figure out a way, post a comment! To clear out the space on your phone immediately, go back to Albums, and Recently Deleted. Click “Select” then “Delete All” to remove them permanently. 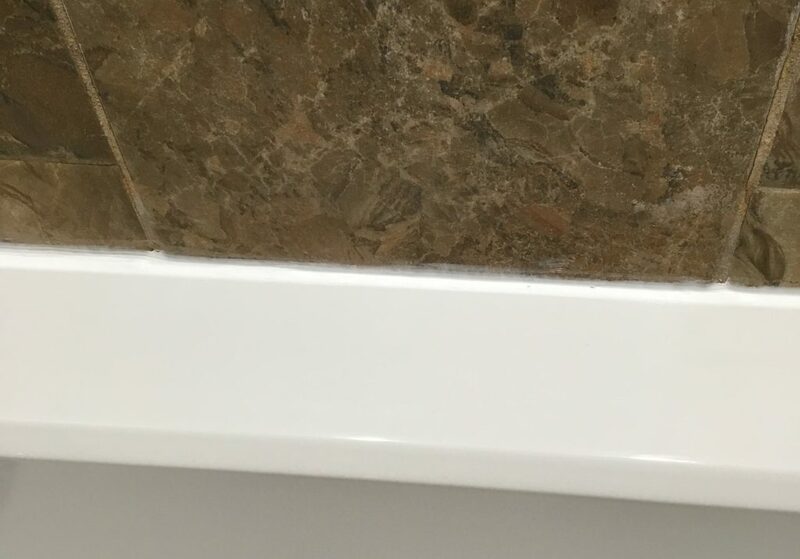 If you’re nervous, you can save this step until after you unhide the ones you’re saving. You’re almost done! 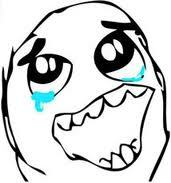 Click on the Hidden album, “Select”, “Select All”, export icon, and “Unhide”. Now they should all be visible again in your Collections.